The Bay Area Rapid Transit District (BART for short) has five lines and forty-four stations, spanning from Richmond to Pittsburg, Fremont, and San Francisco. Although at first glance, it seems to be exactly what its name implies—a rapid transit system—the BART is something much more than a checkpoint between start and destination. 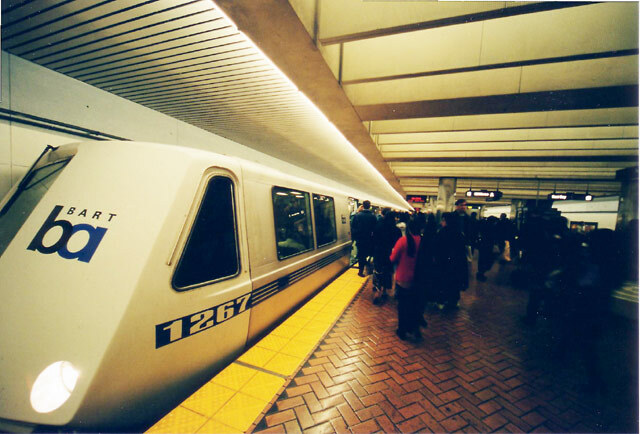 The previous statement could be said for most public transportation systems, but the BART is unique (in the Bay Area, at least) in having routes that go both above and underground. Boarders enter the train in the darkness of the underground station, then find themselves shooting upwards, towards scenes that play through the windows—picture book pages that flip each time they blink. The rush itself is worth the ride, but the interior of the train offers its own charm. People-watching has often been relegated to the category of “things that bored patrons do outside of a coffee shop;” it’s associated more with a lack of interest in one’s own activities (e.g. waiting for a mocha latte) than interest in nearby interactions. However, the activity could be done just about anywhere, given that the situation doesn’t demand a large amount of attention for anything in particular. Letting your eyes drift from passenger to passenger on the BART, rather than under an umbrella outside of a café, allows for observation outside of the hustle-and-bustle of the social setting. You notice little things: long gazes out the windows (It’s like he’s in his own movie…), fluttering eyelids that betray a late night (Hope she doesn’t sleep past her stop…), sudden purse inspections (Did she lose her key? ), sighs of relief (Ah, she found it. ), and so on. Now and then, you see random acts of kindness: passengers giving up their seats, helping with luggage, responding benevolently to “Mind if I sit here?” when it would be much simpler to just give a curt nod…and so on. Quick note: A fun thing to do is listen to music while watching everything play out, both inside and outside of the BART. Turn the duration of the ride into a montage of little things and big sights; see what passes through your mind, and let your internal monologue be the narration. My only tip: keep your glances subtle, lest they overstep the definition of “watching” and begin to merit raised eyebrows and uncomfortable accusations. At some point during my first BART trip, my phone battery ran out due to a combination of GPS abuse and insufficient charging the night before. I’d intended to go from Downtown Berkeley to Powell St. (near Union Square), but took the wrong line and ended up heading towards Fremont. After some help from a stranger, I managed to figure out my way back to Berkeley and take the correct line to SF. Forgetting that there was a such thing as “phone battery,” I spent most of my ride there browsing cat pictures on Reddit (Hey, at least I’m honest about it. ), and had the GPS open for the length of my entire visit. By the time I boarded the train back, my phone had gotten frustrated and entered a voluntary coma. It was then that I discovered people-watching—or rather, fellow-BART-passenger-watching. It was so quiet; left to their own devices, the people around me either fiddled with their things or sat in silence. I disconnected myself from the things going on outside, and focused on the passengers; it seemed as though they were enjoying some brief moments of repose before those picture books outside the windows became reality again. I felt happier watching those people than I did browsing cat pictures (and that says something). Perhaps I’m overestimating the value of a BART ride outside of laptop or smartphone screens, but I can guarantee this: the experience is worth a try. For more posts on travel, click here.